I just finished reading Marc Schloss’ ethnography of the Ehing (Schloss 1988), a group living not far from the Crossroads research area. 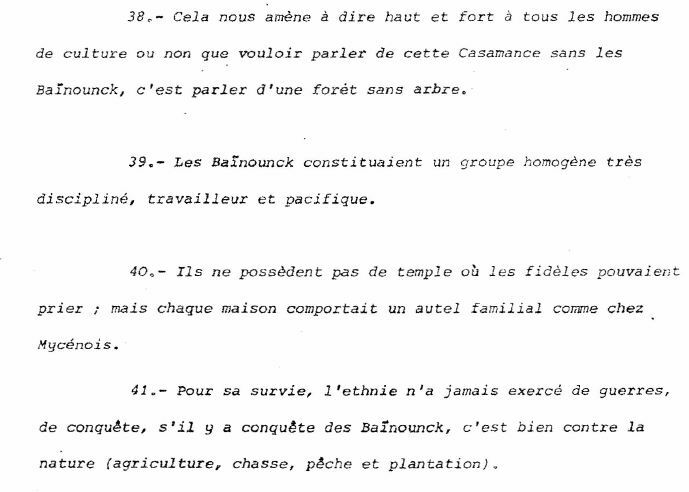 As always when reading anthropologists’ accounts of social life in Casamance, I’m struck by the dissonance between their descriptions of movement, and in particular the movement of women, resulting in diversity being woven into the fabric of society, and the constructions of homogeneous communities that are so pervasive in the public opinion and in the ideologies of community members themselves – here is an extract from the statutes of the Baïnounk lobby organisation BOREPAB to serve as an example. In reality, the vast majority of marriages, in rural and urban settings, is “mixed”. The social organisation of many groups in Casamance and beyond relies on the movement of women into their husbands’ homes. The smaller the group, the more likely it becomes that this movement will bring in women from outside the language area, as I described in my recent post on the Kassanga. But hold on – what is the language area in that case, given that the idea of a zone dominated by one language must become obsolete once the presence of women speaking other languages is acknowledged? Meta Diandy, a Kassanga woman from Ganjand in neighbouring Guinea Bissau, married into Agnack. Language areas are, in those villages where descendance and settlement are determined by patrilineal and virilocal patterns, construed as homogenous places based on male identity, a process that I describe in Lüpke forthcoming a and b). A patrimonial language – the language associated with a place – is the language of the male descendants of its remembered founding lineage. Women often can, and in some cases even must, come from areas associated with other patrimonial languages. Their linguistic identity is erased from the outwardly projected linguistic identity of the place, but of course they don’t fall silent. Since cross-cousin marriages are en vogue throughout the region, they can be the carriers of longstanding societal bilingualism, the daughters marrying into the villages their mothers left when they became somebody’s wife. But women can come from all over Casamance and beyond. Even if they speak the patrimonial language of their new home in many interactions, which is not always the case, the other languages in their repertoires leave traces in their language use and shape grammar and lexicon of the patrimonial language . Their children will assume the ethnolinguistic identity of their fathers and, if they grow up in the village, and not in entirely different linguistic environments, at face value do justice to the image of the community language speaker. But in daily life, they will pick up what is present in actual language use in their environment rather than only the proclaimed community language. Aramata Diandy (left), a Baïnounk Gujaher woman from Agnack, and one of her Mandinka co-wives. Working with women, investigating female language use and, more broadly, linguistic practices of both men and women as gendered, rather than taking male speech and male-centred language ideologies as the benchmark, is still far from being the norm in descriptive and documentary linguistics. Since women are erased from the dominant patrimonially motivated identity discourses, and since their language use doesn’t fit the corresponding ideology, they are often omitted from documentation and lobbying efforts based on what Tony Woodbury calls the “ancestral code mode” of language research (Woodbury 2005). Many descriptive grammars are based – even if only for pragmatic reasons of access and availability – exclusively on the language practice of one or a handful of male speakers. Even recent works on language documentation in Africa recommend to start by focussing on and working with male speakers (Austin & McGill 2012), unless the research has strong sociolinguistic interests. Our ongoing research proves daily that it’s necessary to change tack – not just for the sake of equality and representativeness, which may seem as desirable but too lofty goals to many fieldworkers with limited time and resources. To their concerns, we can reply that including women is crucial in order to collect data that are not skewed due to the limited insight into linguistic behaviour they allow. In the case of West Africa, women’s pervasive mobility, as evident from DNA analyses (Barbieri, Whitten, Beyer, Schreiber, Li & Pakendorf 2012) has tremendous repercussion on linguistic ecologies, language socialisation of children, longstanding patterns of multilingualism and concomitant lexico-grammatical contact phenomena. Many of the widespread areal convergence patterns can’t be explained based on grammars featuring exclusively male language use and on ethnolinguistic groupings based on male-centred ideologies only. Only a close observation of mobility and language use of all community members allows for the development of plausible language contact scenarios. Women, who are crucially involved in the language socialisation of children, are not optional – they are a central key to uncover more complete and intrinsically diverse communication patterns in any society, and it’s more than time to make them visible. Once we as researchers open our eyes to this incontournable fact, every context becomes mixed, not just in urban constellations and as an outcome of migration and globalisation, but because of motivations predating modernity by long. Jaqueline Biai, a Kassanga woman from Ganjand, married into the Gujaher village Agnack, with two of her children.